Earlier this year, reports about Nargis Fakhri finding love in Matt Alonzo created waves. She, who collaborated with the American filmmaker on a couple of music videos, has been uninhibitedly posting about their love for each other since Christmas last year on social media. After getting inked together, the two are now enjoying a romantic trip amidst the picturesque locations of Italy. What more? Nargis Fakhri has been taking to Instagram to share glimpses of her lovely trip with Matt Alonzo. From sharing videos and pictures of their meals to their romance to flaunting their tattoos together, her social media page is filled with tales of their love. In fact, she has even captioned a picture of them together, calling it ‘Romeo and Juliet’. The couple initially enjoyed sightseeing and spending some quality time in Rome. After a short trip there, they have taken off to Venice which is their next destination on the Italian itinerary. In fact, reports have that Nargis Fakhri and Matt Alonzo have already explored the streets of this beautiful city and cruised around the canals. 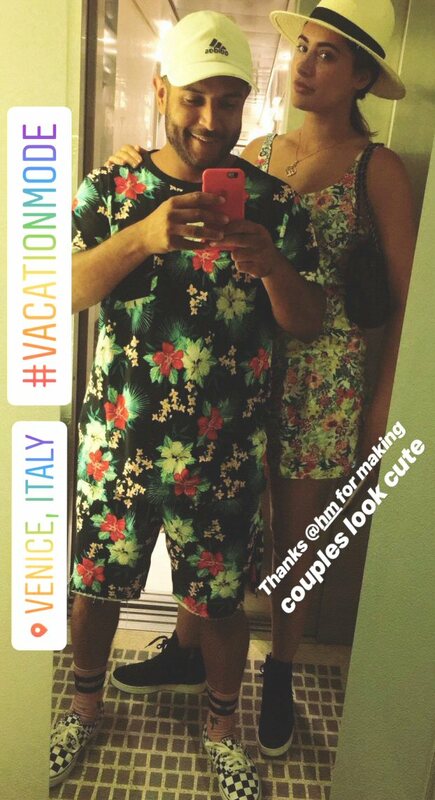 In fact, as a part of her Instagram story, Nargis posted this picture where she is seen twinning with her boyfriend in floral outfits too. Some things are just meant to be. ???? On the film front, Nargis Fakhri will next be seen in Torbaaz which also stars Sanjay Dutt. She was said to be shooting with the actor in Kyrgyzstan for the film recently. Yet another film which is directed by Indian-American filmmaker Namrata Singh Gujral, titled 5 Weddings is in the pipeline. Nargis will feature in the role of a journalist-writer opposite Rajkummar Rao in the said film. The actress is also looking at exploring the music scene by being a part of singles etc.